American pancakes are not a breakfast staple in my house, as much as the kids might wish they were. They are really only for weekends or holidays, and rarely is there a weekend when we don’t have to be out of the house early for one (or both) of the kids’ sporting activities. 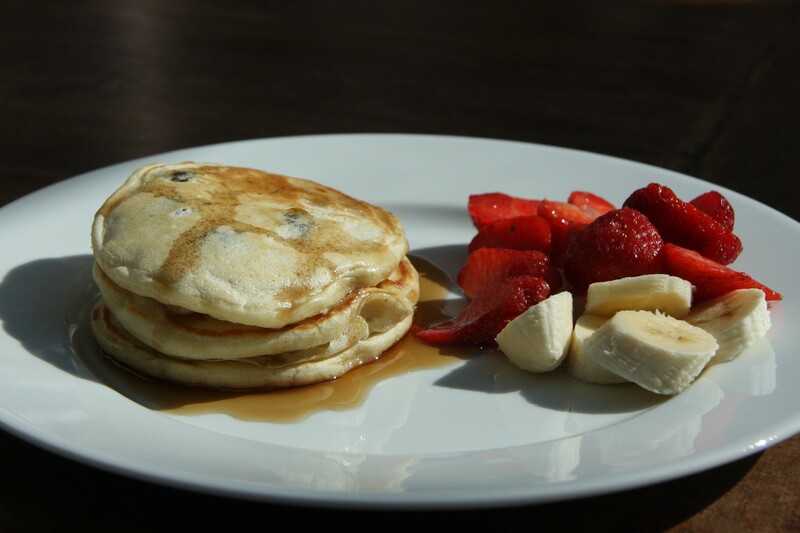 So as a special treat we had homemade blueberry pancakes, which are the best kind because the blueberries cook and become deliciously juicy and soft. With a “side” of fruit and maple syrup. For years I thought there must be some special trick or ingredient in making them and would buy the Aunt Jemima mix (the one where you add milk and eggs). Then I discovered how ridiculously quick and easy they actually are. This recipe doesn’t have any sugar in it because you will add plenty with the maple syrup. 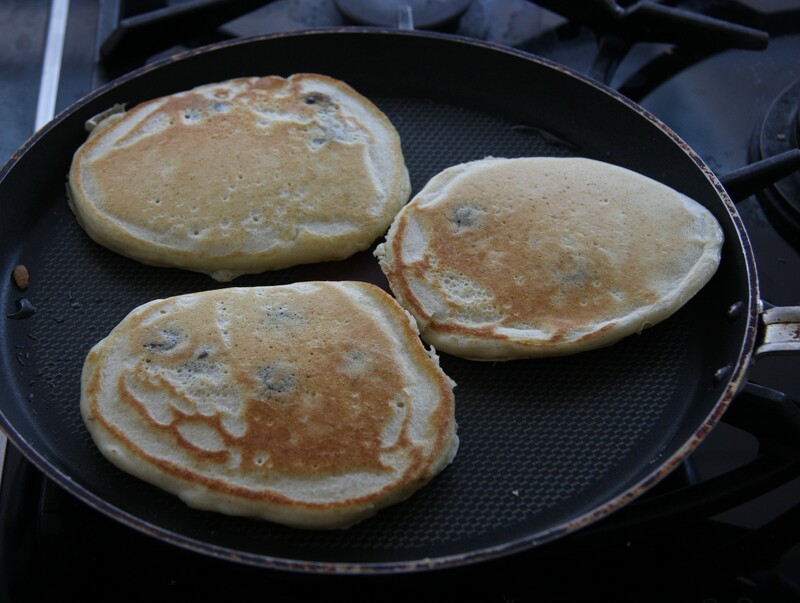 The most important aspect for making good pancakes is the temperature of the frying pan. Too hot and they will be burnt outside and uncooked in the middle, too cool and they will be tough. It often takes a while to get them right! Put the flour into a bowl with the baking powder. Mix together the egg and the milk. Slowly add the milk mixture to the centre of the flour mixture, whisking all the time to incorporate more and more flour without it becoming lumpy. When it is all properly mixed, stir in the blueberries. 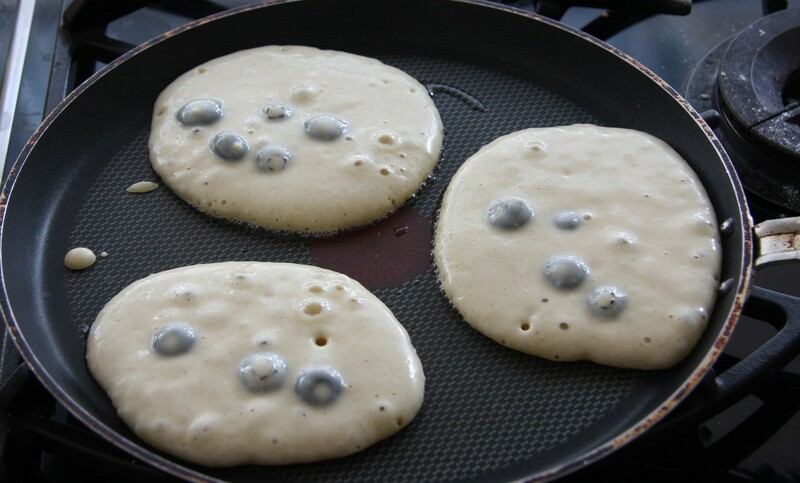 When bubble holes start to appear in the top of the pancakes they are ready to turn. They should be brown on the underside and cooked enough to turn easily. If they are not quite ready the batter will run when you flip them. Turn over and cook the other side until brown and the centre does not feel squishy when you touch it with the spatula. Stack them up when they are cooked and cover with a tea towel to keep them warm while you make the next batch. 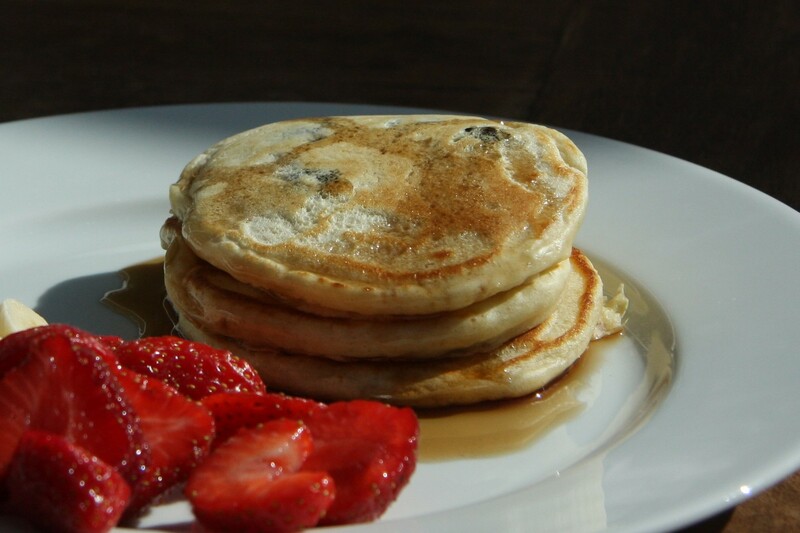 Delicious served with maple syrup and fresh fruit. A summery treat for breakfast. We had them again this morning!